Stuart Creek Dam Modification and Fish Passage Improvements | Prunuske Chatham, Inc.
PCI designed and provided construction oversight on three fish passage improvement projects on Stuart Creek, a tributary to Sonoma Creek outside of the town of Glen Ellen, for Sonoma Land Trust. Stuart Creek is a fairly steep, cobble and boulder bed stream with high sediment transport potential. 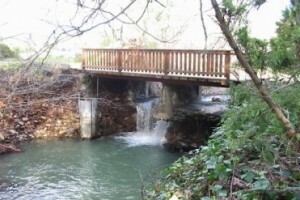 Three man-made partial or total fish passage barriers were on Sonoma Land Trust property. Near where Arnold Drive crosses Stuart Creek is the Stuart Creek Run site, where the footings and abutments of a concrete bridge had been destabilized by channel incision. A 5.5-foot vertical drop underneath the bridge created a complete fish passage barrier. PCI developed and proposed several design alternatives. 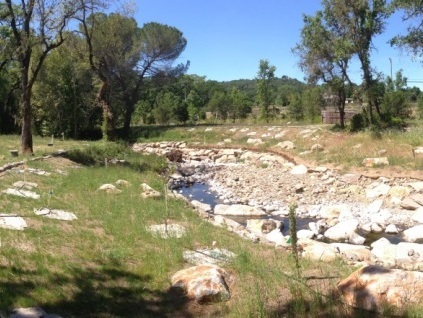 The design approach chosen by Sonoma Land Trust and agency staff utilized multiple engineered roughened chutes and pools over a 310-foot long reach to provide channel stability and natural-channel fish passage conditions while transitioning from the deeply incised downstream conditions to the unincised upstream channel. The installed channel was designed to accommodate and adjust to high sediment loads and is functioning well. Upstream of Stuart Run was the historic Glen Oaks Dam. The dam spillway notch was modified to create improved fish passage conditions for adult and juvenile steelhead while still maintaining the historic structure and the deep pool created by the dam’s constriction. PCI’s scientists and engineers negotiated the design with agency staff using hydraulic predictions of velocities and sediment transport upstream, through, and downstream of the dam. The spillway was lowered and widened, and a notched curb placed on the downstream edge. Channel features have adjusted since construction as expected and are providing fish passage to several miles of unimpaired, wildlands habitat. The Arnold Drive culvert was a partial barrier due to the wide, flat concrete surface under the bridge. A site-specific longitudinal concrete curb and regularly spaced baffles were designed by PCI to be a simple, inexpensive solution that improves low-flow adult and juvenile salmonid passage. A short wall on the upstream end culvert was designed to restrict sediment delivery into and deposition in the fish passage channel.